It's very chic and is bound to be admired when worn! Signed Unsigned but has the trademark Coro pine cone on the end of the tail. Date 1960s. It's very pretty and is bound to be admired when worn! Date 1970s. Job Lot Vintage Silver Tone Necklaces Jewellery Great assortment to include New York charm pendant, perfume bottle pendant, Leo Lion medallion, sea horse, shell, skull and more - 13 in total Good condition, will show signs of vintage wear/tarnish but no visible damage. Please study pics as they form part of the description. Box for display purposes only Please check out my other items for more vintage gems, postage discounts available on multiple purchases. Message me if you have any questions, thank you for looking! It's very chic and is bound to be admired when worn! Condition Report Good - in nice clean condition with light wear.There is minor rubbing to the goldtone. Date 1960s. 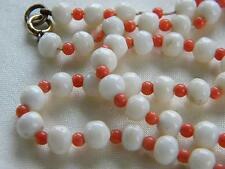 There are matching round glass beads on the chain. The necklace has a good hook clasp. Used see photos. Not sure where it originates from. We are pretty sure it isn't bakelite as you can see the join marks on the beads in the middle and small circular mould marks, which would not be present on bakelite beads. It's very chic and is bound to be admired when worn! It's very elegant and is bound to be admired when worn! Date 1901 - 1920s. Signed WB.s for Ward Brothers. Swirled glass beads graduate from 17 m to 10 mm in length. Interspaced with small yellow glass beads. It fastens with a secure bolt ring clasp. VINTAGE BLACK GLASS / JET ? BEADED NECKLACE . SCREW clasp Any questions please feel free to ask I always combine postage costs for multiple purchases Dispatched with Royal Mail 2nd Class Large Letter. There are two rings linked together and the smaller one has a circle resting on the inside rim. The pendant is decorated with sparkling clear faceted glass crystals which are all present. It is a gorgeous Art Deco design and is very elegant and sparkling. It's very stylish and is bound to be admired when worn! Signed Unsigned but has the trademark Coro pine cone on the end of the tail. Date 1950s. 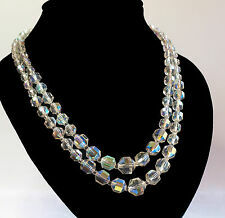 This is a beautiful and stunning vintage necklace. Super sparkly diamond cut borealis crystal gems with stunning flower clasp detail 8" in length when worn so it adorns the decolage area 2 amazing strands of opulence in perfect condition. Graduated gems from large to small to tiny (please study pics) COLLECTABLE Dispatched with Royal Mail 2nd Class Large Letter. 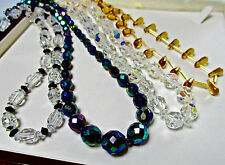 Interspaced with clear and res faceted glass beads. It fastens with a secure bolt ring clasp. PERIOD/STYLE:OLD SCOTTISH CELTIC. A BEAUTIFUL ITEM THAT WOULD LOOK STUNNING ON ANY OCCASION, TO ADD TO A COLLECTION OR GIVE TO THAT SPECIAL PERSON AS A GIFT. DISPLAY BOX: NOT INCLUDED. Signed on Each Section of Necklace. The necklace is made from light gold-tone cable chain as to the sides and fastens with a simple hook into the opposite chain. TWO VINTAGE NECKLACES WITH PRETTY CLASPS. Approx 14.5 INCHES LONG Any questions please feel free to ask I always combine postage costs for multiple purchases A Dispatched with Royal Mail 2nd Class Large Letter. It is in goldtone with a fold over clasp and is decorated with clear baguette and chaton cut crystals, red glass cabochons and an oval cut purple givre glass stone. Date 1980s. It fastens with a secure bolt ring clasp signed on jump ring Made In Czechoslovakia. Sparkling facetted Aquamarine blue Diamante stones. A lovely 1950s cocktail necklace. Rose gold plated claw set closed back. Secure spring adjustable clasp. Width 8mm just over 2/8". Drop Rectangular stone 1.5cm 1/2". Beautiful 1930s green jade bead necklace with brass screw clasp. 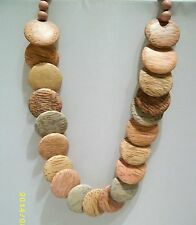 Approx 18 inches in length. In good condition. Catches / pins in working order. Vintage Garnet and Silver Tone Metal Necklace - Unusual. It fastens with a hook clasp. 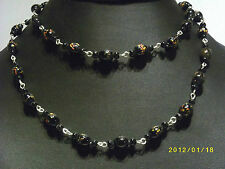 Interspaced with small round glass pearl beads. It fastens with a secure bolt ring clasp. It fastens with a screw barrel clasp. The item is in very good order and fastens with a secure hook catch. 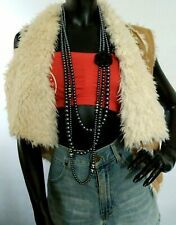 Pierre Cardin Necklace Costume Jewelery . Dispatched with Royal Mail 1st Class. Good tight clasp. Approx 16" (41cm) long. The linked drop is attached to the original gold tone chain, complete with hook clasp for adjusting the length. Box not included in sale. It's great fun and is bound to be admired when worn! Condition Report Good to Fair -There is rubbing to the goldtone on the chain and light wear to the goldtone on the lion but it remains very wearable. The necklace is signed on the reverse by the makers ‘St Justin’. Pretty Art Deco style drop necklace on gold tone chain. Rosita pearl necklace. Cavendish, boxed with 2 necklaces.